Sayed is a 6 year old boy who was diagnosed with Relapsed acute Myeloid Leukemia in the month of May 2016. His Father Zainulabebin works as a labor says that Sayed started showing symptoms from the age of 5. We are daily wage labourers Sayed is our first child. We led a simple life in the small village in Belgaum. But today, we are spending nights in the hallways of paediatric floor of the hospital for our son's life. Sayed came home from school. But I had never seen my child this dull. He was running a temperature. We rushed him to local government hospital. They said it could be due to weather change and should recover in couple of days. But the fever just would not subside. Soon we took him to a bigger hospital in Hubli and the doctors confirmed my son has Acute Myeloid Leukemia, a type of blood cancer. I remember sitting in the doctor's room, holding my son tight. The fear of losing a child the scariest feeling the world. He is planned for a chemotherapy and also a Bone marrow transplant. The cost of chemotherapy and the transplant will cost almost 20 Lakhs and he really needs our help to survive. Zainulabebin earns Rupees 200 a day. His wife is a home-maker and is expecting a baby in the coming months. His income is barely enough to cover his son’s everyday antibiotics. Medical expenses since June 2016 have already been a struggle. It's not easy for a parent to see his child fight complications this grave. 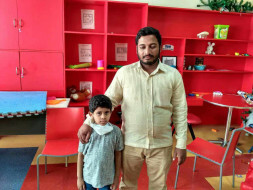 Your support will save his 5 year old son. Sayed passed away on Tuesday (October 3rd). Our hearts go out to this brave child who endured so much pain and fought so hard for his life. For the past few days, he was struggling to breathe and his blood pressure was fluctuating and doctors were administering him treatment. Unfortunately, his body was unable to take the stress. Your timely support ensured that he received the best medical care. The family is grateful for all the care and support you’ve shown Sayed. The past few days have been the most difficult ones for the family. A part of the funds raised have been used for his treatment and we will keep you posted about the usage of the remaining funds. Hope the family finds strength in this time of grief. May Sayed's soul find peace. Please keep the family in your prayers. We have good news to share with you today. 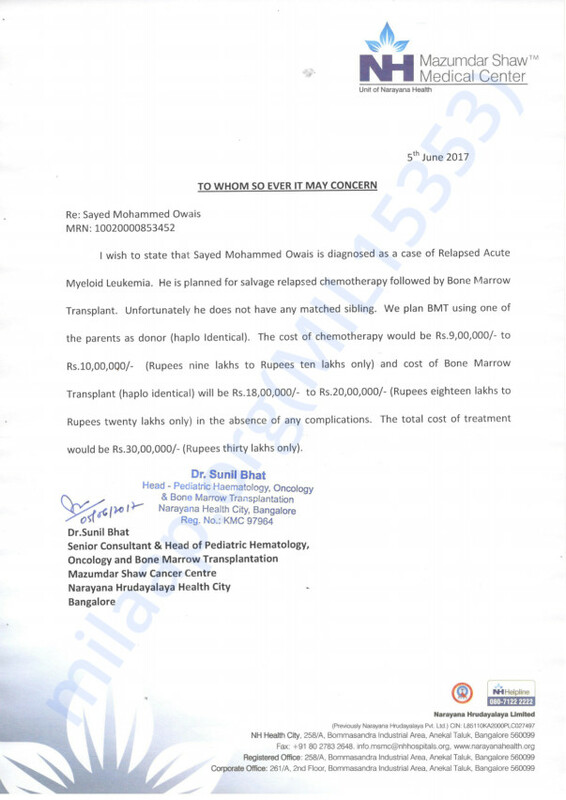 Sayed underwent the Bone Marrow Transplant on 29th August 2017. His father was the donor and has recovered completely. Sayed is recovering now. There is a fluctuation in his blood count. The doctors suggest that the fluctuation in his blood count level is pretty normal and will start to increase slowly with time. The doctors have prescribed him medication to help him in improving his immunity against infection. He will be under observation for a few days. The first few weeks after the bone marrow transplant are very critical. The doctors have suggested for frequent follow-ups for 3 months. Please do keep him in your prayers. Thank you for all the overwhelming love and support that you have shown my Sayed. He is here today only because of all your support and blessings. May Allah cure the child soon, Ameen. God bless you and may you recover soon.